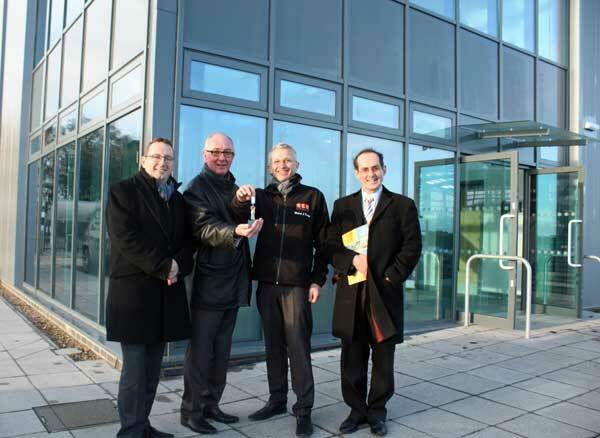 A key-handover ceremony took place this week for the largest speculative business units yet constructed at Beacon Park by Great Yarmouth Borough Council as part of efforts to further boost the growing local economy. The ceremony at the park, in Gorleston-on-Sea, was followed by a special promotional event in which commercial property agents and business advisors were given a guided tour of the two units, which measure 1,415 sq m (15,230sq ft) and 1,912 sq m (20,579sq ft) each, including around 10 per cent as office space. In a sign of confidence in the local economy, Great Yarmouth Borough Council, the owner and developer of the premier park, is investing £8m to build more than 100,000sq ft of floorspace in four phases. Beacon Park is part of the Great Yarmouth and Lowestoft (New Anglia) Enterprise Zone, which focuses on growing energy-related business within the East of England Energy Zone. The two units, which comprise the £3.5m third phase, are targeted at the growing energy sector in the Great Yarmouth borough. Once sold to occupiers, they are estimated to bring around 75 extra jobs to Beacon Park. This week, ELM Contracts, a Great Yarmouth-based construction businesses, officially handed over the keys to Cllr Trevor Wainwright, the council leader. Cllr Wainwright said: “The completion of these new units, delivered by the borough council, is another milestone in the success story of Beacon Park, which is growing fast and supporting the local economy thanks to continued public and private investment, as evidenced by the fact that more than 6,000 sq m (65,000 sq ft) of industrial floorspace is currently under construction for identified energy sector companies. “Before these new units were even finished, there was already strong interest from potential occupiers, focused on the energy sector. And the agents who toured the buildings were also impressed, so I’m confident firms will soon be moving in, securing and creating local jobs. Chris Starkie, managing director of New Anglia Local Enterprise Partnership, said: “We are delighted to see so many new buildings under construction in the Enterprise Zone and new occupiers moving in, bringing new jobs to Great Yarmouth. Michael Fleming, director of ELM Contracts, said: “ELM Contracts are delighted to have undertaken the construction of Units A and B, Lancelot Road, Beacon Park. These two units are the largest speculative builds to have been carried at Beacon Park. The high-specification development includes secure vehicle turning, loading and unloading areas, dedicated car parking space and generous levels of landscaping.